Casey and Death are on the run…again. This time, Casey needs to make her disappearance permanent. After obtaining new identification and throwing herself off the grid, she travels to Florida to begin a new life as Daisy Gray, fitness instructor for a moneyed, enclosed community. But even while keeping her head down, it doesn't take long for Casey to find herself in the middle of trouble. One of the residents is attacked, and Casey is the one to find her, bleeding on the tile floor of the locker room. Despite heroic attempts to save her, she dies, and the community is thrown into turmoil. The cops are at a loss, unable to find anyone who might want the woman dead. Casey, despite Death's encouragement to "get the hell out of Dodge, or, Florida," feels partially responsible, and won't let the murderer get away with it. Besides, where else is she going to go? Is she going to abandon this life so soon, and try to forge another? This book started off rather promisingly. I thought Casey’s a rather unique character who has much strength as well as vulnerability. I don’t know this character well as this is the 3rd book in this series and I have not read the first 2 but from what I gathered, she has gone through some very traumatic experience and is wanted by the police. Through it all, Death is with her. Who is Death? It is death itself, but portray as a character that only Casey and those who are not afraid of death can see and hear. Death, in this book is rather endearing and provides much comic relief to the readers and while Casey kept on asking him to leave her alone, she also seeks him out at times for advices. While the story starts off rather interestingly, the story kind of go down the hills after Casey started her job as a fitness instructor in a residential community. The investigation of ‘whodidit’ was rather amateurish. It was very clear that the killer would be someone within the community and it wasn’t really that challenging to guess ‘whodoneit’. Just follow the clues, conversations, etc and you will be able to guess too. Did I enjoy this book? In a way but not so much that I would seek out the author’s other titles. 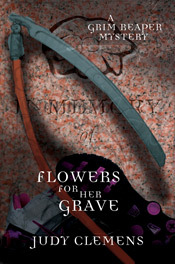 Flowers For Her Grave will be published by Poisoned Pen Press on 2nd August 2011. I review this for netGalley.com.